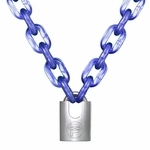 Hex chain is a high alloy chain drawn in a six-sided (hexagonal) shape and heat-treated to be extremely hard. The hex shape does not allow bolt cutters to get a proper bite, which prevents them from cutting the chain. It is ideal for securing equipment or portable tools at a jobsite or for general purpose security. Instead of being hardened merely on the surface (aka "case-hardened"), this chain is hardened all the way through to 53-58 HRC. This means a would-be thief works just as hard to get through the middle of the chain as he does the outside of the chain. 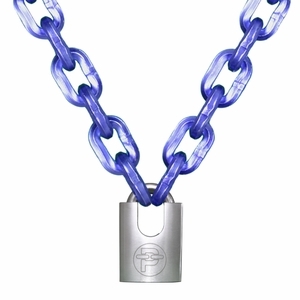 The blue color you see is actually the rust-resistant finish, which helps the chain hold up well in the elements.